Violence has flared in many parts of Bangladesh as schools and most businesses were shut after opposition groups enforced a dawn-to-dusk strike. They called the strike to protest against attacks on their supporters during a road blockade on Sunday. The Bangladesh Nationalist Party and its allies have been demanding a caretaker government be put in place to oversee the next parliamentary polls. At least two people were killed and dozens injured in Sunday's protests. The government last year abolished the system under which caretaker officials take charge ahead of elections. At least 15 vehicles, mostly buses, have been damaged or set alight in and around the capital, Dhaka, since Monday evening and most private vehicles have remained off the roads, says the BBC's Anbarasan Ethirajan in Dhaka. The police fired tear gas on Tuesday to disperse protesters on the street, other reports say. A few crude bombs, plastic pots filled with gun powder, exploded in Dhaka but there were no reports of injuries. "The situation is under control now. In some places miscreants tried to attack the vehicles in Dhaka. 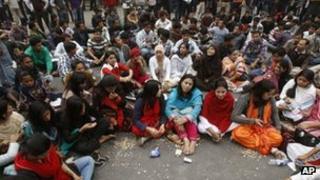 There were some minor incidents and we used tear gas to disperse them," Mohammad Asaduzzaman, an assistant commissioner of police told the BBC. Police also arrested a senior opposition leader in connection with Sunday's protests that saw the opposition alliance block the roads, our correspondent adds. Under the caretaker system, an independent administration at the end of a government's term is set up to try to ensure that elections were conducted in an impartial manner. The government of current Prime Minister Sheikh Hasina says it abolished the system following a court order and has no intention of reversing it. The Bangladesh National Party - led by former Prime Minister Khaleda Zia - called for the blockade on Sunday to try to force the government to restore the system. The opposition, a coalition of at least 18 parties, fears that the elections will not be fair if the ruling party remains in office.